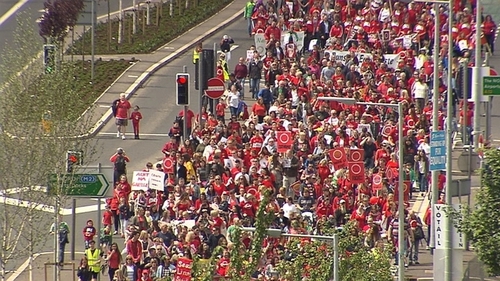 Several thousand people attended a rally in Belfast this afternoon, calling for the introduction of an Irish language act. The proposed law is currently one of the stumbling blocks in the Stormont talks aimed at restoring a power-sharing government in Northern Ireland. Irish language activists from both sides of the border took part in the demonstration. The crowds gathered in West Belfast and walked to Belfast City Centre where several speakers called for a range of measures to accommodate and support Irish speakers. Conradh na Gaeilge said that a £20m budget could accommodate an Irish language act for a five-year period but others dispute the figure. In 2015, Sinn Féin launched a consultation on a law including the use of Irish by public bodies, in the courts and in the Stormont assembly. The Democratic Unionist Party has previously shown little signs of softening its traditional hostility to the language. In February, DUP leader Arlene Foster said more people spoke Polish than Irish in Northern Ireland and declared the party would never agree to an act protecting the language. She likened concessions to Sinn Féin, the chief political proponents of a law, to feeding a crocodile. But last week, Ms Foster appeared to soften, insisting she had not ruled out the possible introduction of an Irish Language Act for Northern Ireland. Speaking at the party's general election campaign launch at Castlereagh Hills Golf Club in Belfast, Ms Foster indicated it could be a possibility, as long as there is also respect for the Ulster Scots, the Orange and the British cultures. When asked if she had changed her mind about an Irish language act, she said: "I said there wouldn't be, in terms of nothing else happening, in terms of culture and language. "We have been in negotiations for some time and we have been putting forward that we need to respect all cultures, including the Ulster Scots, the Orange, the British culture. ""If there are to be moves forward in terms of cultural tolerance and respect, then it has to be in the context of doing that and we are very clear in relation to that." Because of the size of the Belfast rally, some disruption was caused to city centre traffic.